The idea economy is a fascinating, constantly unfolding universe of possibilities that will facilitate commerce and empower us to build better lives. At Bee Partners, it’s our privilege to sit right at the edge of that frontier curve of innovation with some of the most brilliant business minds and makers of our generation. The latest unfolding we were proud to not only witness but help instigate was an awards event we recently co-hosted with CalFounders, the Frontier Innovation Awards 2018: Blockchain (FIA). We began studying blockchain about a year ago and made our first investment in a blockchain-based business at the end of 2017. That company, Tari, launches today; see the story in Fortune. Tari is an open-source, decentralized protocol that will first use blockchain to tackle entertainment ticket sales. We committed to the three-person founding team because of their deep industry and technical understanding gained from years of experience in ticketing and entertainment, blockchain and cryptocurrency. Riccardo “fluffypony” Spagni (more about him below) is lead maintainer of Monero; Naveen Jain is a Y Combinator alum with years of experience as a serial entrepreneur in entertainment; Dan Teree was co-founder of TicketFly, which he led through to its acquisition by Pandora for $450M. The study of blockchain and our relationship with Tari were catalysts for the FIA; it was clear blockchain companies weren’t getting the kind of support we think young companies need. We sought to create a series of events for blockchain companies that parallels the support and operations services we provide portfolio companies. We launched the FIA in January when we put out a call for submissions for the best blockchain business ideas. We read scores of fascinating applications. After selection, over the next three and half months, we guided finalist teams through mentoring: a startup 101 session, office hours, and pitch practice, all supported by a bench of enthusiastic business and blockchain experts. Then we winnowed the final list down to 10 promising startups before throwing them on stage for a timed pitch and subsequent rapid-fire questions from panelists, including Tari’s Spagni, who served as keynote speaker, and Dan Teree, who sat on the panel. A select subset of the community that had supported finalists through mentoring adjourned after pitches and battled out who would be the grand prize winner. It wasn’t easy! Shelf Auctioning Network emerged supreme and we are proud to offer them mentoring from Spagni in recognition of their accomplishment. See all the details here, including the names of the many, many people and institutions who helped make the FIA a success. Our intense study of blockchain came from the persistent expectation we hold ourselves to at Bee, that we’ll adapt to the movement of the frontier curve by constantly educating ourselves and honing our point of view through research and through the lived experiences available when we conduct relevant deal-flow, mentoring, and networking. Ultimately, companies based on blockchain will represent a very small portion of the Bee portfolio; with the investments in Shelf and Tari, they make up two out of 54 portfolio companies. But we knew this paradigm-altering technology development would represent a fundamental change in how commerce is conducted, so it was our duty as investors to understand it deeply. Through the process of writing the white paper, “Bee Partners Industry Insight: Blockchain Opportunities Abound, Discipline Not Forgotten,” and leading the FIA, I’m confident we at Bee have a solid knowledge base and point of view. As always, we believe that base is made stronger with community views and input—and if you’re reading this, you’re part of that community. So please read the white paper, share it broadly, and share your perspectives with me or anyone at Bee. Our partner for the FIA was CalFounders, UC Berkeley’s only community of alumni founders. We’re incredibly proud of our strong relationship with Cal and are always inspired by CalFounders members. A third of FIA finalists had a Cal alum on the team. If you’re a Cal alum and haven’t joined yet, jump on it here! 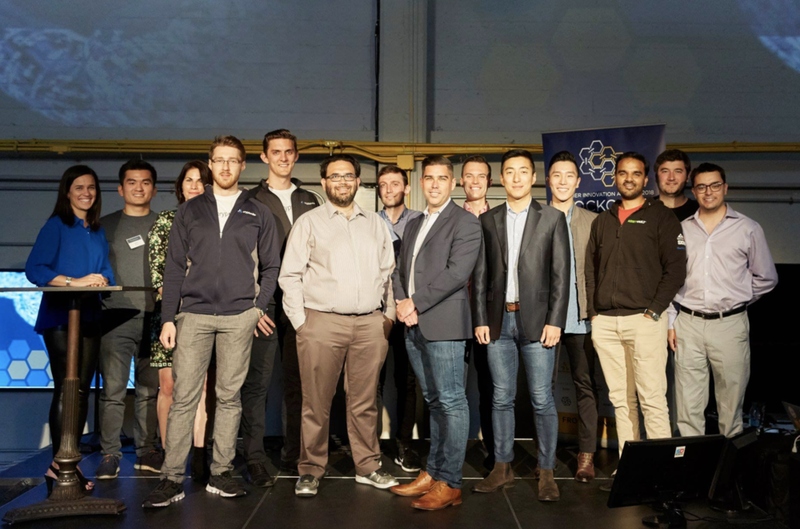 SAN FRANCISCO, CA, May 21, 2018 — Bee Partners, a leading pre-seed VC firm, has offered Shelf Auctioning Network the grand prize of the first Frontier Innovation Awards at a ceremony in San Francisco. The prize offers $500K in funding from Bee Partners, along with mentorship from Riccardo “fluffypony” Spagni, a pioneer in the crypto space and lead maintainer for the Monero Project. Spagni is also, along with Dan Teree and Naveen Jain, co-founder of Bee portfolio company Tari. Support and advising are also offered to the winner and all finalist teams from Bee portfolio company Indiegogo. Shelf Auctioning Network is a distributed car auctioning network that allows users to create a shared inventory liquidity among the interconnected marketplaces and empowers sellers to run and monitor the same auction across their network. This universal technology enables sellers to upload vehicles at one place, but run and monitor the same auction synchronously on all interconnected marketplaces, expanding their sales, reaching more buyers and getting higher margins. Bee Partners invests in founders who drive the idea economy, teams of passionate entrepreneurs possessing deep market insights within enterprise software and frontier technologies. The firm concentrates capital at the earliest stages of venture creation, serving as first investor in over half its portfolio. Cryptonite: Makes crypto-investing & portfolio management as easy as it should be. Kava: Infrastructure for interoperable payment channel networks. Pledgecamp: Decentralized crowdfunding ecosystem that protects, rewards and aligns the interests of key stakeholders. Water Canary: Decentralized water data ecosystem called the Canary Protocol. “Bee Partners was exceptionally supportive throughout this process and their approach for investing in blockchain projects is long-term oriented – a rare opportunity in the current crypto world,” said Lasha Antadze of Shelf Auctioning Network. Indiegogo will offer all finalist teams priority access to their global equity crowdfunding platform or ICO / Token Sale Platform, as determined by type of business. This includes priority review of the company’s materials, application ahead of others in queue, comprehensive feedback on the company’s fundraising strategy, and expert guidance and best practices for raising capital via equity crowdfunding or token sale. The awards ceremony took place at the Folsom Street Foundry in San Francisco and featured a keynote address by Spagni. The evening was MC’d by Fortune magazine’s Jeff John Roberts. The event featured a panel of industry experts, including Dan Teree, co-founder of Ticketfly; Brayton Williams, co-founder of Boost VC; Niko Bonatsos, managing director of General Catalyst; and Lily Liu, co-founder of Earn.com. Judges were Spagni; Jill Carlson, independent consultant at juno; Berolzheimer; Andy Bromberg, CEO of CoinList; and Spencer Bogart of Blockchain Capital. We are grateful for our event partners and sponsors: Blockchain Capital, Blockchain at Berkeley, SkyDeck, Accel, General Catalyst, Scalar Capital, Samsung Next, CryptoParency, and Run8 Patent Group. 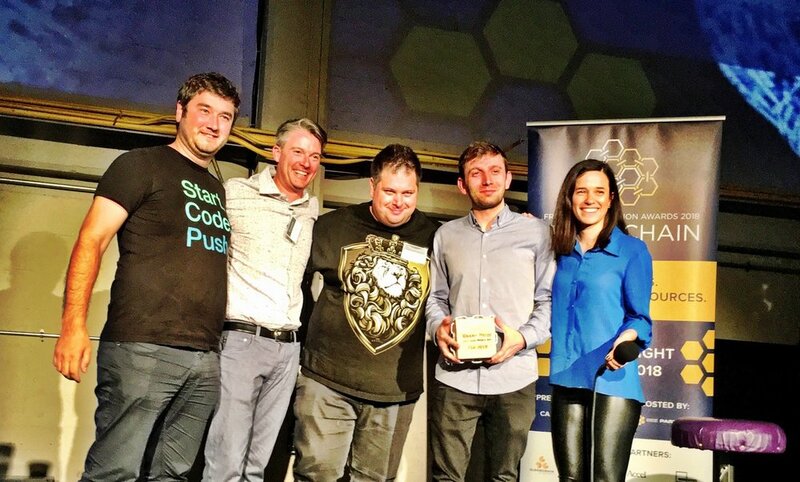 We have big news to share: Bee Partners is hosting a series of events, the Frontier Innovation Awards 2018: Blockchain, presented by CalFounders, that will culminate in recognition at a May 11 awards night, $250K in equity or token funding from Bee, and mentorship from Monero’s Riccardo ‘fluffypony’ Spagni, who is also serving as the awards night keynote speaker. In the weeks leading up to the awards night, finalists will participate in a Startup 101 workshop geared to blockchain, and then be provided pitch practice and office hours from an all-star lineup of blockchain, startup, and business leaders. Aligned with our founder-focused ethos and partnership mission, the Frontier Innovation Awards 2018: Blockchain will put founders first, celebrating and supporting them as they build the foundation for their blockchain ventures. The event represents our own enthusiasm for blockchain-based innovations and the rapidly growing blockchain intellectual community, a healthy representation of which thrives on the UC Berkeley campus (terrestrial and virtual). As it has whenever faced with radically new cultural developments, Cal has led the way in educating its students and broadening the global knowledge base on blockchain. Its spring 2018 blockchain course and two student-led (or DeCal) classes are packed. True to the public service mission of the University, the student group Blockchain at Berkeley, which we’re proud to collaborate with, serves the wider East Bay community. Cal and Blockchain at Berkeley have hosted notable blockchain events which have drawn deserved worldwide attention, including 2017’s Crypto Economics Security Conference and the ICO Financing Conference. Now, I wouldn’t be surprised to hear that the first question on your mind is, Why on earth would professional investors focus on blockchain given the massive ICO fundraising the technology makes possible with no check-writing from venture at all? I’m happy to answer that because my colleagues at Bee and I have spent most of last year in deep study of blockchain, cryptocurrency, and ICOs, and have found some powerful convergences between those worlds and our own. Our intensive review and our experiences with founders who are basing their businesses on blockchain have confirmed that venture can and should play a vital role in the success of these endeavors. The year 2017 strangely felt reminiscent of 1993, as we were living at the dawn of the next internet, or Web 3.0: We were aware of a startlingly new paradigm based in a little understood technology and a set of strongly-held core beliefs. We began our study of blockchain in earnest last summer, crafting our thesis into a white paper and meeting with dozens of experts. Later in the year, we put our research to work, ultimately making our first blockchain token investment in a private, pre-ICO sale in December (official announcement coming soon). Just as we do with traditional equity investing at the pre-seed, we conducted our due diligence around the company’s team, business opportunity, and milestones. It took significant research to understand why blockchain was mission critical to this venture, and to the technology and token-economic solutions proposed. We analyzed and discussed the company’s white paper at length. As we diligenced, we validated our hunch early on as to why the founders sought professional investors to begin with: They acknowledged that they couldn’t build their solution in isolation and without strategic support. This made it clear: The teams on this new frontier are pioneers in entirely unfamiliar territory. 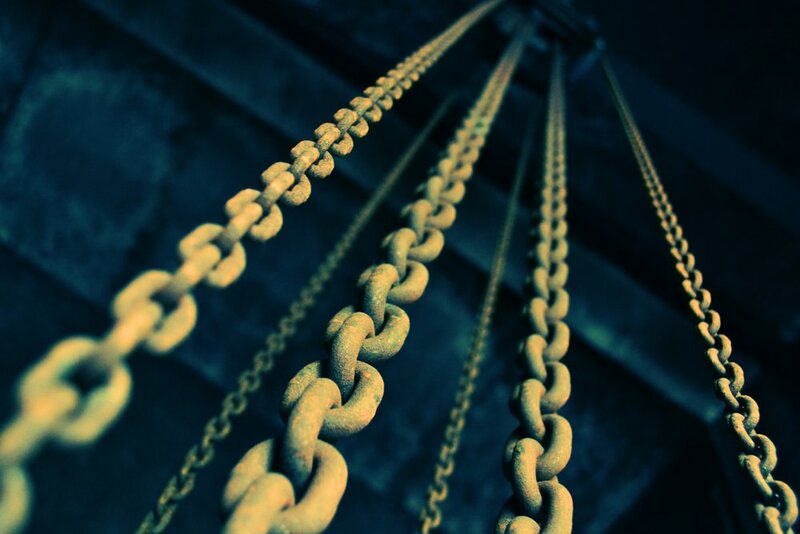 They face massive challenges in both extricating blockchain’s potential as a technology, and in understanding cryptoeconomics and the network economy’s Central Bank-like model. These founders need partners to help them face this brave new world without stumbling and making avoidable mistakes. Ironically, despite the anti-VC headwinds, they need VC partnership more than ever. In instances where an established company is focused on an ultimate ICO, VCs can play a critical role in helping the company achieve product-market-fit before it declares its offering and before tokens are distributed to end users. Prominent examples of blockchain companies that raised equity pre-ICO are Storj ($30M), Brave ($35M), and Civic ($33M). This is a growing trend that inspires confidence in a solid business foundation beneath the token-fueled valuation (and room to pivot as needed, which is much harder post-ICO). As with any nascent technology, the most immediate challenges ahead for blockchain-based businesses lie in scalability, infrastructure, regulation, and defining an acceptable user experience. We are excited to be on the frontier with these founders as they explore blockchain’s potential. It is our contention that blockchain is analogous to email for money and that it represents the biggest upheaval in the internet since the Mosaic browser. The Frontier Innovation Awards 2018: Blockchain marks our commitment to recognizing and embracing the power of blockchain, its interoperable applications, and the users and connected devices that will transform markets and restructure the fundamentals of doing business.